Thanks for the support Open! The last two days I have woken with a stiffness through my neck, shoulders and back...the feeling you might get from holding one position too long. Those words seem to ring true for me - becoming a fixed position in the flow. I am perceiving it as the tension I have been holding through the resistance of feeling through the chaos. And I do have the question inside of what is chaos? It's felt as lack of order, lack of harmony. Parts of this have truth as there is plenty of disharmonious vibes. But there is also an internal need to get rid of the disharmony. There is then a judgement about what is occurring ...as the disharmony serves a purpose -reflecting where there is a lack of alignment (in me). And even if the disharmony locally was resolved within, there are within the manifest plenty of knots in the flow, 'grey areas', 'dark areas'. If I am able to be ok with that (on a felt energetic level) then I am the One in it, otherwise I am an identity that needs to have things be light and harmonious. Can I allow this to be? (self-inquiry) - to feel the general mix of things and trust that all is moving toward alignment in its own way, without my need to hasten it for my own comfort. It seems, hastening happens naturally, if it's right to, through acceptance of the energy and realignment within. Lots of new things are coming to the forefront and it always helps me see more clearly when I express it. I have noticed for a long time that I feel very uncomfortable around men with strong Ray 1 energy - at the same time I am very drawn to it as well. The discomfort causes me to avoid this type of character or shut down internally in a variety of ways - kind of going numb on multiple levels. I will feel a strongly attractive impulse and then close down or go into heightened states of anxiety. I get the feeling this is abut the inner rejection of this type of energy...seeing some connections to a dream last night. In the dream, my youngest son (who is 11 - I share this as I feel its pointing to how I felt at this age) died choking on a celery stick. Immediately following I am on a trip with a group of people that I don't feel at ease with - a group of couples that I don't hang out with. I am carrying this sadness of the death of my son, but still going on. It's very clear that I don't belong there and three of the men start finding fault with me - specifically that I gave someone a gift - a lip balm - that exploded all over their technology and they are angry about it - their eyes have turned completely black. Then the scene changes and there are people choking and vomiting around me and then looking through the contents of what was brought up. And yet I don't feel this is exactly about expressing Ray 1 - what feels right to me is that it's about being willing to stay present with the wanting to run away or going numb in the face of that strong masculine energy - it is a reaction - one that seems so deeply encoded and I can imagine all the ways in which this was wired in. Yet at the bottom of all the reasons and specifics of experiences, there is still just a willingness (or not) to remain open to the flow of what is moving within...feels vulnerable - wide open in a way - not knowing what will come ...facing this energy actually feels like an invitation to meet myself more nakedly and being open to how to be in the moment. I appreciate your dream on a very deep level and find that my post last week elicited supportive advice and encouragement that led me to have a similar experience regarding my masculine divine energy, which I had not even realize I had been attempting to stifle for my entire life. The part about vomiting really got to me, because I physically spent over a year vomiting and ended up in the hospital one day (literally according to the ER doctor) away from death. They "fixed" my physical problem, but I continued the vomiting in my dream world (in some form or another) for a long time following. My deep exploration and breakthrough techniques helped me come to such a place of calm peace and unity balance that I have been feeling tempted (randomly ;) to create something to offset the balance because I have, as it turns out, been doing that for my entire life! I had NO IDEA just how deep this conditioning stuff could go and I appreciate your sharing as I feel we are all helping each other grow so much more quickly in the exploration! The synchronicities that we see so often are speaking even louder now. A woman that is in my conscious dance class is studying healing techniques and asked if I would be one of her subjects. I went Friday morning (solstice) and had the BEST healing where she said she saw dragon and fire and a snow owl and that it felt as though my whole body was ignited and at odds with itself, but then calmed down completely during her healing and my fitbit watch even registered the calm! I had seen a picture, the day prior, of a person's phone lock screen and it said 4:44, 4 % battery and 4G...it was a post on FB and the background was a fire breathing dragon. When I was on the way to her house I was thinking of how I felt a bit of Shiva destroying so many attachments and constructs...I then looked at my directions and saw that the road I was about to turn on said "Phoenix", which is in the picture that I have attempted to post with this entry. After I got home from the healing I attended a global stargate activation meditation and yesterday was literally the BEST day of my life. I have NEVER EVER felt so free. I know that there is so much more to explore on this journey and I REALLY appreciate how learning from and how you navigate your experience enhances my life experiences significantly. Sending you so much love!!!!! The return of Ray 1 masculine has also been a big theme for me this past year. Just like you Jen ,I used to shut down in presence of strong wilful men who express Ray 1 quite emphatically. Also, I was never entirely comfortable with my sexuality and so it was a double whammy as far as connecting with such men was concerned. This was ,in my workplace typified by a man I felt very uncomfortable with because he was very expressive of his masculine sexuality . In the last year ,as so much has moved for me ,I have started occupying my sacral chakra more. That's how it feels . After all the bawling on the yoga mat ,I feel like I more deeply occupy my own body especially my pelvis. Yesterday I had a very intense conversation with him interestingly about consent and the Me Too movement . There were a couple for times he ' crossed the line ' and expressed fairly physically how he found me deeply attractive . This time, rather than retreating into fear and lashing out ,I was able to get him to see how this was not a good idea all without shutting down my sexuality. It felt like a conversation between friends and I felt as if some circle.has been closed ,some.energy regained. As far as your dream was concerned ,technology stood out for me.as.did black eyes and I got.Orion. The examination of vomiting was also.something that spiked. Something that you cannot swallow about the masculine needs examining . Thank you so much for your sharing. The dreamworld contains so much richness...I am in awe of what the subconscious can produce to illuminate whats not yet fully conscious or integrated (or at least that's how I see it at the moment). Wow - I love the enthusiasm with which you share your story. =) Vomiting is interesting theme isn't it...fascinating that the theme went in and out of physical manifestation for you. It sounds like you have had some big realizations around the expression of the masculine. I am feeling like there is a new layer of stuff to "look through/feel through/find me in" at the moment - thank so much for just being there and reflecting back to me. As soon as I read the title of the post, my heart kind of skipped a beat. Yes, befriending the masculine...ugh...not sure why that's my actual response hah! The other day marked a major relationship shift and later that night I had intense pain/heaviness/cramping in my pelvis - like labor pains. Things are changing also as I am suddenly being approached quite often by men...I am not liking that so much and it's causing me to notice how uncomfortable I am with it all. I sense some major sh*t coming up here - stuff I haven't had to look at til now. Yes, it feels very related to sexuality as well as transparency/intimacy. It's coming to me now that it has something to do with not wanting to be deeply seen and perhaps something of feeling unloveable/undesirable. Well, surely life is stirring the pot and I get the feeling that things will be showing up on the scene to see what it is that's freaking me out and find more freedom in these situations. Very interesting what you said about Orion, that has been coming up multiple times lately...there was definitely another energy coming through the men in my dreams...something that scared me and brought up the feeling of physical vulnerability and being preyed upon. Wow! The insane amount of growth and insight that you guys bring is mind boggling! I am so grateful for even the tiniest nugget that sparks exploration to further my connection to the source. I have been exploring why my feminine/masculine has been so out of balance and trying to discover why I brought such injustice to my life and doing breakthrough breathing and other techniques to coax forth that "truth" and "light" that will guide me towards my "answers". Funny that the man that harmed me and my children was named Ryan and I actually nicknamed him "ORyan", lmao!!!!! When I ready both of your posts and explored the guidance I am blown away by the insights you have both offered! Megha, you said "Something that you cannot swallow about the masculine needs examining." and that was like a freight train to the forehead! This whole time I was so concerned that I was not feminine enough, because I am so afraid to show or explore sexuality and this whole time it could be just because it is highly imbalanced...I invited (by manifesting) one sexual abuse after another (or denial of sexual impulses, thoughts or feelings). Deep down I realize that I must have invited the darkness within Ryan (who ended up being the man who gave me biological children after multiple doctors said it was medically impossible and multiple miscarriages) because there were wounds needed to shed the skin of this trauma surrounding sexuality that I just kept putting band aids over and re-inviting into my life.. I read a lot on here and don't always post, but when you share your deep (and often vulnerable) truth it ALWAYS sparks something in my that takes me to that place where I can release something that has been holding me back and then I do whatever activity brings me the most joy and I don't feel bad about that joy, despite what my mind is telling me I "should" be doing instead...I know that this path is right and true and I am so blessed to have such lovely beings of light exploring and sharing, guiding us through this together! Jen, I also want to say that you are the first "Open" person that I met in person...the light you shine is so lovely and being around you is warm and comforting. I appreciate you beyond words and, because of our "work" at the intensive, I can see your loveliness as my reflection...especially in our exploring/navigating these energies here with Megha and knowing that we are peeling away the illusion...we are eternal! I observed something interesting while being out there in the drama related to talking about Openhand with other people and events. I was filling out this personal assessment form and one of the question was to list affiliations or belonging to any of groups/communities and originally felt resistance listing Openhand there. I remember myself coming with all kind of excuses (it is not a religions nor organization and so on ...). 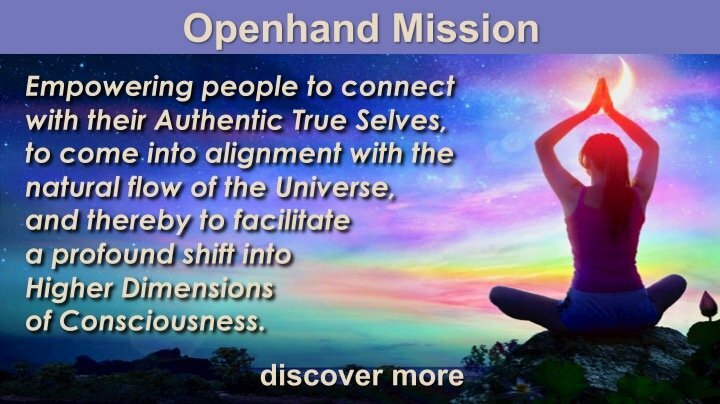 After some time, I have realized that it may have to do with the message that Openhand brings and how people would react to it. For me, possibly it was a sense of being rejected, abandoned, not accepted. I know I have to stand my truth. I did go back and added Openhand there even no one is going to pay attention to it. The Ray 4 diplomacy can be used to get a sense across and still stay in my truth. I may have to work through things as they come up and I am not going to abandon myself and the team anymore. The time is now. Time to step out and be you! What fires the higher vibe for you?